On July 16, 1969, a Gemini rocket lifted off from Kennedy Space Center in Florida. Previous launches had focused on getting astronauts into space, docking two spacecraft, and even walking in space, but this mission was different. Apollo 11 was designed to land two astronauts on the moon and then bring them back to Earth. Four days later, two astronauts, Neal Armstrong and Buzz Aldrin, did walk on the moon. But did you know that there were actually three astronauts aboard the rocket on July 16? Michael Collins didn’t get to walk on the Moon, but his contribution is just as important as Armstrong and Aldrin’s. Prior to joining NASA, Collins was in the Air Force and flew fighter jets. After joining NASA, he made two trips into space, performing one of the first EVAs or Extravehicular activities (in other words, walking in space) as well as making that trip to the moon. Collins continued to contribute even after leaving the space program. He took a job in the State Department and even served as director of the National Air & Space Museum and as undersecretary of the Smithsonian Institution in Washington, DC. He may not have walked on the moon, but he’s one of only twenty-four people to travel there. 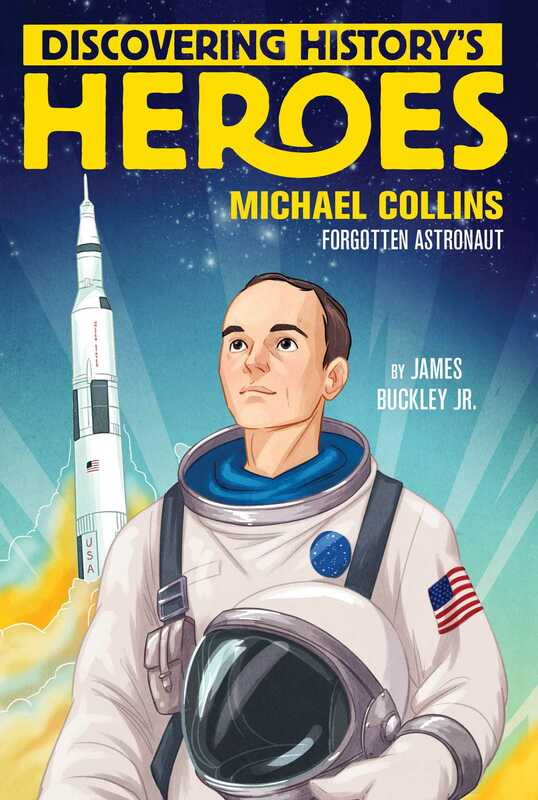 In fact, without Michael Collins, that first moon landing might never have happened. James Buckley Jr. is a prolific author of nonfiction for young readers. Bonnie and Clyde joins a long list of his biographies that cover Adolf Hitley, Milton Hershey, Betsy Ross, Jesse Owens, Muhammad Ali, and Roberto Clemente, among many others. Other recent books include titles on the International Space Station, the Moon, snakes, insects, firefighters, history, and sports of various kinds. That latter subject is a big part of his work, following on a career in sports journalism with Sports Illustrated and the National Football League. He is the owner of Shoreline Publishing Group, a book packager based in his home of Santa Barbara, California, where he lives with his wife and two teenagers.